The National Party was elected in 1948 on the policy of Apartheid ('separateness'). This 'separateness' put South Africans of different racial groups on their own paths in a partitioned system of development. The policy goal of separate development allowed the National Party to maintain the status quo of white supremacy as well as control the African labour needed for rapid industrial development (Baldwin, 1975: 218). Separate development was supposed to allow Africans to develop themselves under their own self-government, but the economic structure of South Africa made that impossible (Marquard, 1969: 256). During the Second World War, there was rapid urbanization by Africans. The lack of infrastructure in South African cities led to the phenomenon of overcrowding and squatting on empty land by those seeking employment. In many cases, the scramble for housing created mixed neighbourhoods (Marquard, 1969: 43). 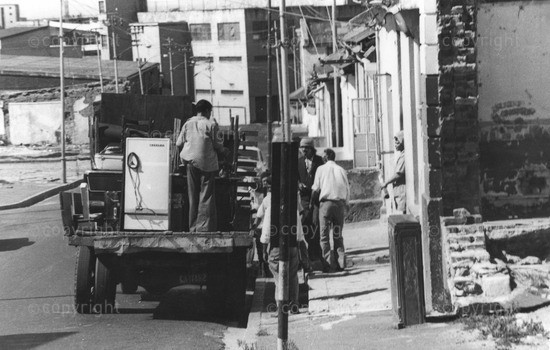 The Group Areas Act was fashioned as the “cornerstone” of Apartheid policy and aimed to eliminate mixed neighbourhoods in favour of racially segregated ones which would allow South Africans to develop separately (South African Institute for Race Relations, 1950: 26). When the Group Areas Act (GAA) was passed in 1950, it imposed control over interracial property transactions and property occupation throughout South Africa (Horrell, 1978: 71). It was amended almost annually and was re-enacted in the Consolidation Acts of 1957 and 1966. The GAA created the legal framework for varying levels of government to establish particular neighbourhoods as 'group areas', where only people of a particular race were able to reside (South African Institute for Race Relations, 1952: 32). The GAA displaced hundreds of thousands of people; breaking up families, friends, and communities. This was due in large part to the retroactive application of the law, meaning that once an area was declared a group area, the GAA had the power to demolish all the houses there and displace everyone who was not of the designated group (Mabin, 1992a: 422). The GAA added more restrictions to the lives of Africans and it was one of the first drastic rights infringements for the Indian and Coloured populations (Marquard, 1969: 163). Trouble in Natal - Group Areas. October, 1959. The GAA was one of many pieces of legislation used to control the lives of Indians, Coloureds, and Africans, in this instance by limiting property rights. A distinction between the GAA and its predecessors was that segregationist measures passed before 1948 were less coherent and often provisional in nature. Legislation passed by the Apartheid government were done in a more clearly defined pattern to implement Apartheid (Horrell, 1978: xi). Many pieces of legislation passed under the pretence of segregation were in actuality attempts to control the labour of Africans. The GAA was another layer in controlling the movement and life of urban Black, Indian or Coloured persons (Baldwin, 1975: 218). Rural immigration to cities began as early as the middle of the 19th century, though the amount of time these migrants stayed in urban centres was fairly different case by case. As the rapid expansion of the production of export products like wine and wool began, so too did African urbanization, as migrants found jobs working on railways, docks, and in manufacturing. Along with the varying amount of time spent working in cities, the extent to which families migrated to join the urban breadwinner varied greatly. This is a trend that continues in the present day (Mabin, 1992b: 14). The Glen Gray Act of 1894 restricted the ability for African men to own land in the Cape (Root & Wachira, 2009: 668). The Act also imposed a labour tax of ten shillings a year on land owned by Africans unless they could prove that they had been employed outside of their designated reserve area for at least three months (Wilson, 1953: 243). During the early 20th century, many of the impositions of segregation were associated with emergency epidemics. For example, shortly after the discovery of bubonic plague in Johannesburg in 1904, the city burned down its African slums which drove Africans to the Kilpspruit sewage farm, creating the first exclusively African settlement (Swanson, 1977: 388). The late 19th century approach of “containment” to control outbreaks in Europe with sanitary legislation was highly influential to South African policies towards slum and overcrowding which were identified as the source of the outbreaks of disease. European “containment” was seen by Whites in South Africa as the appropriate response to what they perceived as their country's social problems as from the 1870s onwards. Fear of cholera, small pox, and plague epidemics were used to justify the efforts to segregate Indians and Africans in urban areas (Swanson, 1977: 390). This method of behaviour is illustrated by the 1885 Asiatic Bazaar law (No. 3 of 1885) which authorized the government to create separate districts for Indians for reasons of sanitation (Dison and Mohamed, 1960: 24). The Asiatic Bazaar law was reinforced in 1932 by a committee in Transvaal known as the 'Transvaal Asiatic Land Tenure Act'. It included a clause that was later dropped which would have forced local authorities to set aside 'Asiatic' areas (Mabin, 1992a: 409). During the plague crisis at the beginning of the twentieth century in the Cape, the government used the Public Health Act to move between six-thousand and seventhousand Africans to Uitvlugt, a sewage farm several miles from the city in the Cape Flats (Swanson, 1977: 393). The Locations Act of 1903 in Port Elizabeth aimed to control the settlement of Africans in the region. The Mayor estimated that about ten thousand Africans lived within the city limits, and another four-thousand had moved beyond the city limits. It tried to facilitate African migration to an area called 'New Brighton' but was largely unsuccessful in this goal (Swanson, 1977: 401). The 1913 Natives Land Act was one of the first pieces of legislation that limited property rights of Africans in South Africa. Before the Natives Land Act, Africans were able to purchase land outside of their reserves, with differing degrees of restrictions, but the Natives Land Act limited the landmass where they were allowed to own land to approximately 9 million hectares, and created specific areas (which came to be known as 'homelands') within which whites were not allowed to buy land (Horrell, 1978: 3). The outcome of the act was, as Sol Plaajte said, to make the African “a pariah in the land of his birth.” (1914: 1). Africans who had purchased land outside of homelands were generally allowed to keep it in cases where it was adjacent to a homeland. In cases where a African owned farm was surrounded by White-owned farms, it became known as a “black spot”. Later in the 20th century, the government took steps to eliminate these black spots. The Natives Land Act initially allocated approximately 8 per cent of South African land to be purchasable by Africans (Beinhart, 2001, 10). Ten years after the Natives Land Act was passed, the Smuts government passed the 1923 Native Urban Areas Act which gave municipalities greater powers to segregate housing, to police African communities and to control movement by imposing passes. It specified that alternative housing had to be provided for those who were moved by its implementation (Horrell, 1978: 2). An amendment to the Act in 1937 forbid Africans from acquiring property from non-Africans in cities and townships (Kirkwood, 2: 1951). However, the act led to constant housing shortages throughout the 20th century. Since Whites were legally stipulated to be paid more than Africans for the same work, the regulations that required Whites to do most of the work on public housing projects significantly exacerbated their cost (Horrell, 1978: 77). In 1924, the Smuts and then the Pact government aimed to pass the “Class Areas Bill,” which would have restricted Indian residential and trading rights. However, the Bill was never passed, as it was faced with vehement opposition within South Africa as well as abroad (Horrell, 1978: 5). New powers were given to the Governor-General by the 1927 Native Administration Act. It allowed Governors-General to govern Africans by proclamation, including the ability to order that any tribe, section of a tribe, or African to move from one place to another without notice. It also allowed the Governor-General to be able to decree that Africans were not to leave any stated area for a specific period (Horrell, 1978: 4). The Native Land Act was updated in 1936 via the Native Trust and Land Act which added an additional 6.2 million hectares to the reserves where Africans could purchase land (Horrell, 1978: 4). This expanded the total percentage of land in South Africa which could be purchased by an African from 8% to 13%. (Hellmann, 1949: 174). While Africans did still occupy land owned either by the Crown or by absentee white landlords, as nearly a quarter of a million did by the late 1920s, their tenure was insecure as they were not legally entitled to hold the deed for that land, and thus could be evicted at any time (Bundy, 1972: 384). The Native Trust and Land Act gave new powers to the Department of Native Administration and Development which allowed it to begin to evict owners of 'black spots' (land owned by Africans surrounded by White-owned farms) (Horrell, 1978: 203). Furthermore, during the 1930s, White farmers tried to force Africans to labour on their farms for six months as a payment of rent towards land tenure. While they were unsuccessful in doing so, this demonstrates the degree of ambiguity that African tenure held during the early 20th century (Beinhart, 2001: 136). 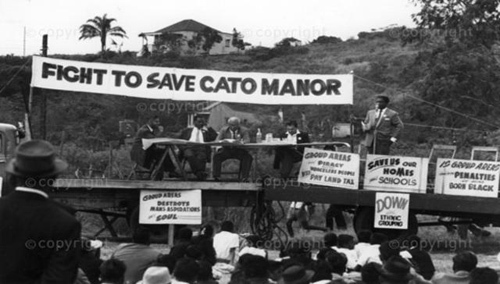 Africans were prohibited from acquiring land from non-Africans by the Native Laws Amendment Act of 1937. The only circumstance under which it was allowed was with the consent of the Governor-General. Additionally, it prohibited the construction of new churches, schools, or other institutions which would mainly cater to Africans in urban areas without approval from the Minister of Native Affairs, though this did not affect institutions established before 1938. It allowed towns to apply to have areas declared as closed to entry of Africans other than those who were either visiting, employed, or seeking to be employed there (Horrell, 1978: 3). In 1950, the Population Registration Act provided for compulsory racial classification on a national register. Documents were issued to people based on the racial group they were designated. The groups named were Europeans, Coloured, and Natives. Coloured people and Natives were also subcategorized according to their ethnic group. A Race Classification Board was set up to adjudicate disputed cases. Identity cards were issued to all people over the age of sixteen and authorized officials (e.g. police officers) were empowered to demand anyone of that age or older to produce their identity cards. Those who failed to produce their identity cards had seven days to report to a police station (South African Institute for Race Relations, 1950: 24). In April 1950, the Minister of the Interior introduced the “Group Areas Bill,” which became law on July 12th of that year. The Group Areas Act (GAA) systematized segregation in the control of transfers of land and immovable property (property which cannot be moved without being severely altered or destroyed, like a house) as well as occupation rights throughout the Union of South Africa, with the exception of reserves. The consequence was that one could only buy property from people of the same race (South African Institute for Race Relations, 1950: 26). Many of the measures in the Act were interim measures until the establishment of 'full group areas', or complete residential segregation (Kirkwood, 1951: 24). One of the first major changes in South African property law made by the GAA was the creation of 'controlled' areas. Controlled areas were any area which was not a group area; a Native area, location, or village; or a Coloured persons settlement, mission station, or communal reserve. Controlled areas had particular provisions for the ownership of immovable property (1.v). In specified and controlled areas, inter-racial property transactions and changes in occupation of property were subject to permit. In controlled areas, the criteria for occupation was the group of the owner, whereas in specified areas it was the group of the occupier. So for instance in a controlled area, if the owner of the property was White then the occupant needed to be White, while in a specified area the owner could be White while the occupant could be Indian. Disqualified persons or companies were allowed to enter, or continue, an agreement for a lease or sub-lease of a property in a specified area but could not do so in a controlled area without a permit (South African Institute for Race Relations, 1953, 45). The GAA was administered by the Land Tenure Advisory Board (the Board) and the Minister of the Interior (the Minister). Group areas were created, after the bill passed, by making a proposal to the Board, which was appointed by the Minister. The Board had to make a report to the Minister as to whether or not an area should have been proclaimed a group area. Before it advised the Minister, the Board had to give the public an opportunity to have input on the decision (27.2, 27.3). The Board also had to take into consideration the availability of accommodations for the people displaced by the decision. However, it was the role of other departments, not the Board, to find alternative accommodation for people displaced by the declaration of group areas (27.5). The Minister was not compelled to listen to the advisement of the Board but was required to read it before issuing a proclamation (26). The Board modelled after the Asiatic Land Tenure Board (from the previously mentioned Transvaal Asiatic Land Tenure Act of 1932). It was composed of no more than seven members who could be dismissed by the Minister (24.1 and 24.4d). Unlike the Asiatic Land Tenure Board, members could serve for no longer than five years and there were no explicit provisions allowing Coloureds or Africans to serve on the Board (24.3). Section 2 of the Act defined the 'groups' as White, Native, and Coloured. The group of women was determined by who they married to or cohabited with (2.1.abc). African or Coloured groups could be further subdivided by the Governor-General on ethnic, linguistic, or cultural grounds (2.2). The Governor-General would declare areas as 'group areas' and give the residents who are not of the specified group at least one year to leave (ie, that a particular neighbourhood is now a White neighbourhood so all Coloured or Native residents must leave the area by the date specified in the proclamation)(3.1a). The GAA did not itself create 'group areas' but established the machinery to create them (Kirkwood, 1951: 8). The creation process of group areas was explained in Section 3. It specified that, for the first five years after the passage of the GAA, the Governor-General had the power to create group areas for Whites in provinces of the Cape of Good Hope and Natal, or areas already set aside in the Transvaal for people who were Native or Coloured. After the first five years had elapsed, these proclamations would be subject to approval by both Houses of Parliament (3.3a). Proclamations could only be given once the Minister had considered a report by the Board and had to consult with the Administrator of the Province affected, the Minister of Mines in the case of any land proclaimed under any mining related law and the Natural Resources Development Council if the area was on any land which they controlled (3.3b). However, proclamations would be withdrawn at any time by the Minister or the Governor-General (33). Those who were not of the 'group' of an area became a 'disqualified person' under Section 4. Disqualified persons were not allowed to occupy any land or premises in any group area to which a proclamation relates, except under the authority of a permit (4.1). The exceptions to this section were any servant or employee of either the state, a statutory body, or of those who were lawfully occupying the land; a visitor staying in a home of a lawfully residing person or at hotel for no more than ninety days; or any person under the control of the state, either as a patient of a hospital or of a similar institution or as an inmate of a prison or similar institution (4.2). This section also made the proclamation of a group area override any legal agreements which would prohibit or restrict those who were designated as the lawful occupants (ie, if an African is leasing an apartment in a White area, the lease would expire after the date specified in the proclamation) (4.3). No one lawfully occupying any land was allowed to help a disqualified person occupy land without the authority of a permit (10.1). The GAA would not interfere with arrangements made by the Housing Act (1920) or Housing (Emergency Powers) Act of 1945 as long as they were of the appropriate group for the group area (10.2d). It also made exceptions for native labourers governed by the Native Labour Regulation Act (1911) as along as the company which recruited them was lawfully occupying the land or premises where they were housing them (10.2i). The ownership rights of disqualified people and companies were further clarified in Section 5, as to the acquisition of property in group areas, and Section 8, as to the acquisition of property by disqualified people in controlled areas. Disqualified persons and companies were not allowed to acquire any property in group areas without a permit (5.1a). The inheritance of any immovable property by a disqualified person was made illegal unless they had a permit to do so. The executor of the will had a year (or longer if the Minister of the Interior allowed it) to sell the now illegally owned property. The inheritor was entitled to the profit of the sale, as long as it was done in time (5.3). The ownership of property by disqualified companies in group areas were required to pursue a permit to continue to own it and their ownership would expire after ten years (5.1bc). However, mining companies were exempt from this portion of the law (5.2) Section 8 detailed the restrictions on disqualified persons and immovable property in controlled areas. It disallowed disqualified people from acquiring immovable property, unless they were a Native acquiring property already governed by preceding legislation, and made state officials as being authorized to act on the behalf of those who owned the property (8). If any immovable property was acquired or held illegally without the correct permit, Section 20 of the GAA empowered the Minister to force the owner to sell the property within a three months, but if it was not sold within one month the Minister could sell it at public auction (20.1). The proceeds of the sale were first used to cover any associated costs and, in the case of the property being owned by a company, the rest would go to the company. In any other cases, unless otherwise directed by the Minister, the money would be directed into the Consolidated Revenue Fund (20.2). Furthermore, the Minister and any officer designated by him were empowered to do whatever was necessary to effect the transfer of any property sold to whomever purchased it (20.6). Any property registered in the name of someone who was not lawfully able to hold or acquire it was subject to penalties (22.2). The GAA stringently restricted trading licenses. Any officer of licenses could withhold or not issue a license to an applicant who they “[had] reason to believe” is applying on the behalf of someone for whom it would be illegal to hold such a license (23.1). Controlled and specified areas also had consequences for businesses. Controlled areas allowed only persons of the same racial group as the owner to trade on the premises, while in specified areas only members of the same racial group as the people who occupied the area could trade on the premises (Kirkwood, 1951: 27). Failure to comply with the GAA had significant consequences. Violators of the act could receive fines of up to two hundred pounds, imprisonment for a period not exceeding two years, or both punishments (34.1). Violators of the act could have also been faced with forced evictions. If they did not comply they received either fines of sixty pounds, imprisonment for six months or both, as well as an additional fine of five pounds for each day they failed to comply with the eviction order (34.2 and 34.3). The GAA had strange implications for governance and responsibility as it became more elaborate and amended. For example, the Coloured townships of Coronationville, Noordgesig, Newclare, Riverlea, and Western Township are administrated by Johannesburg City Council while Bosmont is the responsibility of the Department of Community Development (South African Institute of Race Relations, 1964: 216). The work of welfare organizations was made more difficult by the GAA, like Lunalegwaba House, a group home for African boys, in Johannesburg could not operate because the regulations of the GAA did not allow the White charity to own the property (South African Institute for Race Relations, 1967: 306). People attempted to use the courts to overturn the GAA, though each time they were unsuccessful (Dugard, 1978, 324). 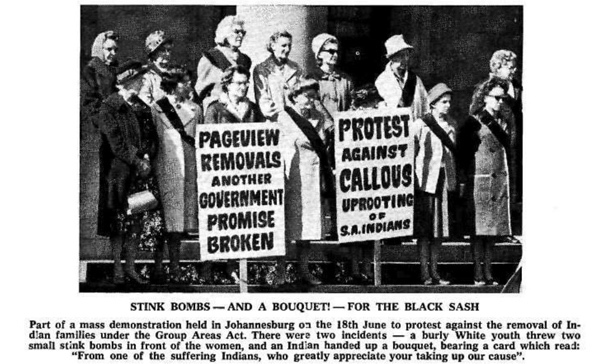 Others decided to use civil disobedience and other protests, like ‘sit-ins’ at restaurants, were experienced across South Africa in the early 60s. The 'sit-ins' were not ill-received by the average White citizen, which the South African Institute of Race Relations believed proved that they did not object to sharing restaurants with the other racial groups (1961: 183). 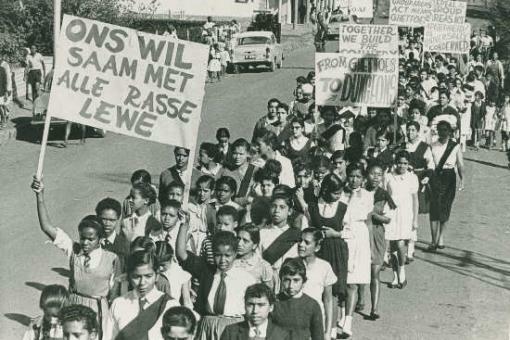 There was also resistance from Cape Town City Council who voted before 1964 to keep District Six and the central business district not dedicated to any one racial group; they had the support of the Cape Town Chamber of Commerce on this decision (South African Institute of Race Relations, 1964: 213). This article was written by Patricia Johnson-Castle and forms part of the SAHO Public History Internship. • Baldwin, Alan. Mass Removals and Separate Development. Journal of Southern African Studies.1(2), 215-227, April, 1975. • Beinhart, William. 2001. Twentieth-Century South Africa. Oxford: Oxford University Press. • Bundy, Colin. 1972. The Emergence and Decline of a South African Peasantry. African Affairs. 71(285), 369-388, October. • Christopher, A. J. 1987. 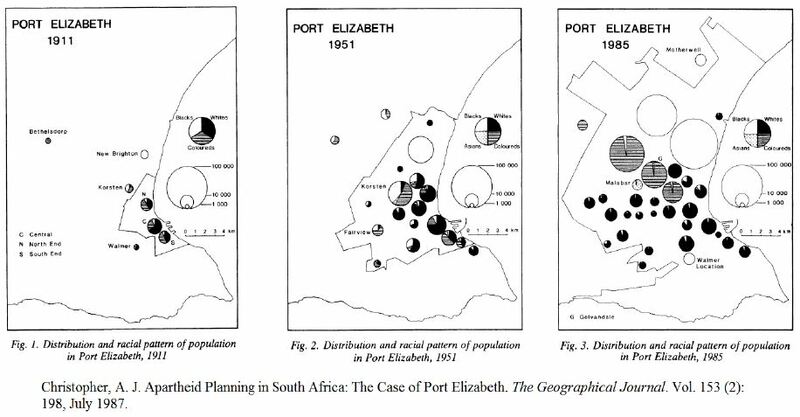 Apartheid Planning in South Africa: The Case of Port Elizabeth. The Geographical Journal. 153 (2), 195-204, July. • Dison, L. R., I Mohammed. 1960. Group Areas and their Development, including Land Tenure and Occupation. Durban: Buttersworths. • Duggard, John. 1978. Human Rights and the South African Legal Order. Princeton, New Jersey: Princeton University Press. • Hellmann, Ellen.(ed). 1949. Handbook on Race Relations in South Africa. London: Oxford University Press. • Horrell, Muriel. (ed). 1977. A Survey of Race Relations in South Africa: 1977. Johannesburg: South African Institute of Race Relations. • Horrell, Muriel & Dudley Horner, (ed). 1974. A Survey of Race Relations in South Africa: 1973. Johannesburg: South African Institute of Race Relations. • Horrell, Muriel. (ed). 1966. A Survey of Race Relations in South Africa: 1966. Johannesburg: South African Institute of Race Relations. • Horrell, Muriel. (ed). 1966. A Survey of Race Relations in South Africa: 1965. Johannesburg: South African Institute of Race Relations. • Horrell, Muriel. (ed). 1964. A Survey of Race Relations in South Africa: 1961-1964. Johannesburg: South African Institute of Race Relations. • Horrell, Muriel. (ed). 1958. A Survey of Race Relations in South Africa: 1957-58. Johannesburg: South African Institute of Race Relations. • Horrell, Muriel. (ed). 1956. A Survey of Race Relations in South Africa: 1955-56. Johannesburg: South African Institute of Race Relations. • Horrell, Muriel. (ed). 1954. A Survey of Race Relations in South Africa: 1953-54. Johannesburg: South African Institute of Race Relations. • Horrell, Muriel. (ed). 1953. A Survey of Race Relations in South Africa: 1952-53. Johannesburg: South African Institute of Race Relations. • Horrell, Muriel. (ed). 1952. A Survey of Race Relations in South Africa: 1951-52. Johannesburg: South African Institute of Race Relations. • Horrell, Muriel. (ed). 1951. A Survey of Race Relations in South Africa: 1950-51. Johannesburg: South African Institute of Race Relations. • Horrell, Muriel. (ed). 1950. A Survey of Race Relations in South Africa: 1949-50. Johannesburg: South African Institute of Race Relations. • Kirkwood, Kenneth. 1950. The Group Areas Act. Johannesburg: South African Institute of Race Relations. • Maharaj, Brij. 1994. The Group Areas Act and Community Destruction in South Africa. Urban Forum. 5(2), 1-25, June. • Mabin, Alan. 1992. Comprehensive Segregation: The Origins of the Group Areas Act and Its Planning Apparatuses. Journal of Southern African Studies. 18(2), 405-429, June 1992. • Mabin, Alan. 1992. Dispossession, exploitation and struggle: an historical overview of South African urbanization. The Apartheid City and Beyond, 13-24. • Marquard, Leo. 1969. The Peoples and Policies of South Africa. Oxford: Oxford University Press. • O'Malley, Padraig. 1950. Group Areas Act No 41. <https://www.nelsonmandela.org/omalley/index.php/site/q/03lv01538/04lv018... 01839.htm > Accessed 1 December 2013. • Plaajte, Sol.1916. Native Life in South Africa. Johannesburg: Ravan Press. • Root, D & N Wachira. 2009. A legacy of empire: the imposition, evolution and failure of construction skills training systems in Kenya and South Africa. In: Dainty, A R J (Ed. ), Proceedings 25th Annual ARCOM Conference, Nottingham, UK. Association of Researchers in Construction Management, Vol. 1, 665”“74, 7-9 September. • Swanson, Maynard W. 1977. The Sanitation Syndrome: Bubonic Plague and Urban Native Policy in the Cape Colony 1909. The Journal of African History. 18(3), 387-410. Cambridge: Cambrige University Press. • Wilson, Everett K. 1953. Review of The Smoke That Thunders. The Antioch Review. 13(2), 240- 46, Summer.